The PGFireBoxÂ® quickly, cleanly, and cost-effectively eliminates wood and vegetative waste, while producing electric and thermal energy perfect for heating drying kilns. Does away with hauling and grinding and reduces handling. Construction on Georgia Renewable Power’s 58-MW biomass power plant in Franklin County, Georgia, officially began in January 2018. By March 2019, when this photo was taken, the company had made significant progress on this project and its twin sister plant in Madison County, Georgia. At press time in April, both facilities were undergoing commissioning. GRP anticipates full operation in June. Biomass Magazine: (USPS No. 5336) May/June 2019, Vol. 13, Issue 3. Biomass Magazine is published bi-monthly by BBI International. Principal Office: 308 Second Ave. N., Suite 304, Grand Forks, ND 58203. Periodicals Postage Paid at Grand Forks, North Dakota and additional mailing offices. POSTMASTER: Send address changes to Biomass Magazine/Subscriptions, 308 Second Ave. N., Suite 304, Grand Forks, North Dakota 58203. Slow and steady wins the race—or does a fast pace earn a place? As a runner myself, being honest, slow doesn’t usually earn a medal. When it comes to project development, however, the winning projects usually aren’t the ones speeding to the finish line. In the biomass industry, we’ve seen how rushing projects has fared, particularly in the domestic wood pellet market. It became oversaturated for a short stint about a decade ago, but is finally balancing out after some hard lessons. F.E. Wood Energy in Sanford, Maine, is the newest domestic market-focused wood pellet plant to come online in the U.S. in a quite a while. The concept was on the table for years, as the father and son team knew that doing its homework on feedstock markets and availability, design, technology and end markets meant taking the long road, but it would lead the company to a place that made sense. “We were itching to get back into it in a way that we could have a sustainable, long-term future,” Wood says. In our page-32 feature, “Building Globally, Impacting Locally,” by Staff Writer Patrick Miller, Tony Wood discusses long-term relationships with sawmills, loggers and landowners in the area, the thorough design evaluation done prior to selecting equipment, and how independent retailers are the backbone of the company’s plans. In the same story—drawing a comparison of sorts to the domestic and industrial markets and their driving forces—Enviva Partners shares details of its ongoing expansion and new construction projects, which will enable the company to meet growing demand from overseas customers. Continuing that note of new development, be sure to check out our page-24 feature, “The Twin Biomass Sisters of Franklin and Madison Counties,” by Senior Editor Ron Kotrba. 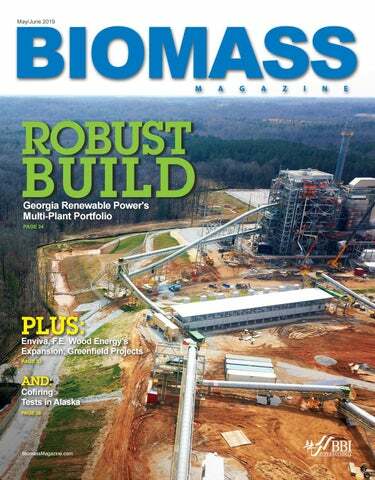 In it, Kotrba digs into the development and construction of Georgia Renewable Power’s 58-MW biomass power plants, which are currently undergoing commissioning. Also in this issue, you’ll find an extensive review of utility-scale cofiring tests performed in Alaska, and a photo review of the International Biomass Conference & Expo, where market expansion and project development was a key theme. And, of course, the positive messages our industry should convey to the public and policymakers, because without their support, it’s a lot more difficult to get a shovel in the ground. Subscriptions Biomass Magazine is free of charge to everyone with the exception of a shipping and handling charge for anyone outside the United States. To subscribe, visit www.BiomassMagazine.com or you can send your mailing address and payment (checks made out to BBI International) to Biomass Magazine Subscriptions, 308 Second Ave. N., Suite 304, Grand Forks, ND 58203. You can also fax a subscription form to 701-746-5367. Back Issues & Reprints Select back issues are available for $3.95 each, plus shipping. Article reprints are also available for a fee. 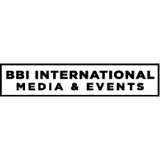 For more information, contact us at 701-746-8385 or service@ bbiinternational.com. Advertising Biomass Magazine provides a specific topic delivered to a highly targeted audience. We are committed to editorial excellence and high-quality print production. To find out more about Biomass Magazine advertising opportunities, please contact us at 701-746-8385 or service@bbiinternational.com. Letters to the Editor We welcome letters to the editor. Send to Biomass Magazine Letters to the Editor, 308 2nd Ave. N., Suite 304, Grand Forks, ND 58203 or email to asimet@bbiinternational.com. Please include your name, address and phone number. Letters may be edited for clarity and/or space. The new industry standard for energy efficiency, yield and D3 RIN production. M A X I M I Z E PROFITS D3 RINS CORN GRIND ETHANOL YIELD CORN OIL RECOVERY CORN FIBER TO ETHANOL At ethanol plants across the country, there’s an evolution going on. Producers are demanding more than just standard ethanol production from their facilities. They’re demanding “bolt-on” technologies that are easily added and suitable for their plant. D3MAX delivers that cutting-edge technology by converting corn fiber and residual starch in distillers grains to cellulosic ethanol. This is a 1.3 billion gallon per year market and with D3MAX ethanol producers can maximize their yield and profits. Some myths never seem to die. They morph from grains of truth in academic papers to slogans on bumper stickers, and then get debated by society for decades. In other instances, they’re based in solid science, but then get pushed beyond their logical limit. The following are our top three on both sides of the debate about whether biomass should be used to heat homes and institutions. Humans are conditioned to some wood smoke. “Humans have cooked and heated with wood for millennia. Why all the fuss now?” True, but we only began living past the age of 30 about 30,000 years ago. And just 2,000 years ago, half of Romans who lived to the age of 15 died before they were 45. Along with modern plumbing and penicillin, one of the most important human health inventions was the chimney. Paired with a good stove, a good chimney can get close to 100 percent of smoke out of living space. People disliked wood smoke in their homes in colonial America as much as they dislike it today. And the health impacts of breathing wood smoke are still just as bad. It’s carbon neutral. “Trees absorb carbon from the atmosphere as they grow, and if a tree is burned for fuel, another tree will replace it and reabsorb the carbon.” The theory is sound, but in practice, it’s much more complicated. The carbon impact of burning wood is on a spectrum from very good to very bad, all depending on how it’s done. Few would argue that harvesting old-growth forest in ecologically sensitive areas in the Carpathian Mountains of Romania and national parks in Slovakia is carbon neutral. And few would argue that from a carbon perspective, using trees blown down by Hurricane Katrina to heat homes in the eastern U.S. is a far better use of carbon than using oil or gas. The impossible task is to find one average point on that spectrum that assigns a carbon footprint to using a ton of wood for energy. There are many points on the spectrum, and the sooner we recognize that, the better. Healthy forests are managed forests. “There are a myriad of good reasons to manage a forest, especially as impacts of climate change make some forests far more vulnerable to catastrophic wild fires. Well-managed forests can provide many habitat and ecosystem benefits.” That said, foresters can overstate their case, and be slow to acknowledge that “management” can be a guise for practices that aren’t sustainable. Plantations harvested every 20 years do not recoup the ecological diversity and carbon sequestration that the original, natural forest had. Macquarie Infrastructure Partners acquires Wheelabrator Macquarie Infrastructure Partners and Wheelabrator Technologies Inc. announced that MIP, acting through one of its managed funds, has completed the purchase of Wheelabrator from funds managed by Energy Capital Partners. MIP operates within the Macquarie Infrastructure and Real Assets division of Macquarie Group. Wheelabrator is a leading owner and operator of waste-to-energy (WTE) facilities, with a platform of 25 assets in the U.S. and the U.K, including 19 WTE facilities (three under construction), two waste fuel facilities and four ash monofills. Wheelabrator also recovers metals for recycling at two advanced metals recovery systems and is in the process of developing a central upgrade facility. Morbark introduces Rayco T415 Forestry Mulcher and Hydra-Stumper Morbark LLC announced the debut of the Rayco T415 Forestry Machine. The T415 Rayco T415 Forestry Machine allows customers to change between a Predator forestry mower/mulcher head and a Hydra Stumper stump cutter attachment for optimal versatility. Powered by a 415-horsepower (310-kW) CAT C9.3B Diesel Tier 4 Final engine, the T415 boasts a closed-loop hydrostatic system to power the mulcher or cutter head, sending 140 gallons per minute to the attachmentâ&#x20AC;&#x2122;s drive motor(s). The hydraulic output is power optimized to match the engineâ&#x20AC;&#x2122;s power curve, keeping the mulcher/stumper RPM constant, even under load for a finer mulched product with fewer passes. HOW DO YOU STOP AN INDUSTRIAL EXPLOSION IN ITS TRACKS? Associated British Ports announced that Martin Bardle, formerly the company’s head of compliance, has stepped into an operational position and taken up the helm at ImmingBardle ham’s Humber International Terminal. The site handles 10 percent of the country’s energy cargo and hosts the largest biomass handling facility in the United Kingdom—Immingham Renewable Fuels Terminal, the result of a 2015 agreement with Drax Power Station. Prior to his port career, Bardle worked for the British Army as a plant and equipment fitter apprentice and served for almost 15 years in the Royal Engineers. After leaving the Army, Martin worked in a succession of health and safety leadership roles with companies such as Balfour Beatty, Rolls-Royce and Mace. Martin holds a Master of Business Administration from Warwick Business School and a Master of Science in Occupational and Environmental Health and Safety Management. He joined ABP on the Humber in 2015. Sustainable Biomass Partnership CEO Carsten Huljus has named the organization’s technical committee members, who took up their positions with immediate effect. The technical committee is a representation of specialist expertise across the disciplines encompassed by the SBP standards, including forest management, feedstock processing and biomass distribution, as well as knowledge of auditing, certification and accreditation processes and procedures. The role of the committee is to provide advice to the board on SBP's technical and scientific functions. The six members are Kim Cesafsky, manager of sustainability at Enviva; Anders Hildeman, forestry and certification independent consultant; Brenda Hopkin, forestry and certification independent consultant; Peter Kofod Kristensen, senior lead sustainability advisor at Ørsted; Rob Shaw, technical manager at Soil Association Certification Ltd.; and Martin Walter, an independent consultant and professor in timber trade, wood manufacturing and certification at the Weihenstephan-Triesdorf University of Applied Sciences. It depends on a number of critical factors. How explosible is the material you are processing? Are your process vessels indoors? How are the upstream and downstream processes configured? What ignition sources could be present? Our engineers start by understanding your process, reviewing your DHA and testing process materials if necessary. Then we apply the right solution including a combination of suppression, isolation and venting systems. Why risk an industrial explosion that could threaten your workers or shut down valuable processes. Count on IEP Technologies to provide the right solution. Just like we have done successfully for hundreds of industrial companies around the world. Call the IEP engineering experts with the most experience in explosion protection at 1-855-793-8407 or visit IEPTechnologies.com. struction contract and is expected to take approximately 36 months to complete. Covanta will provide technical oversight during construction and supply operations and maintenance services when the project commences operations in 2022. SCS offering SFI Chain-of-Custody Standard SCS Global Services is now offering chain-of-custody certification to the Sustainable Forestry Initiative Chain-of-Custody Standard. SFI is a leading, credible certification in North America for responsible forest products. This new service offering leverages SCS as a one-stop shop for the wood and paper industries, providing clients with increased efficiency for dual and triple chain-of-custody certification to the major three forest sustainability standards. SCS is also currently undergoing accreditation for, and will soon be offering certification services for SFI Forest Management and SFI Fiber Sourcing Standards. SoCalGas’s Minter named RNG champion Southern California Gas Co. recently announced George Minter, the company’s regional vice president of external affairs and environmental policy, was named Renewable Natural Gas Champion by Climate Resolve, a Los AnMinter geles-based nonprofit organization that focuses on local solutions to global climate change. At SoCalGas, Minter is responsible for the company’s public affairs, community relations, public policy and energy and environmental affairs functions. He is a long-time policy professional specializing in energy and environmental matters, program development, communications and political advocacy. Climate Resolve lauded Minter’s efforts to increase the use of renewable natural gas to reduce greenhouse gas emissions in a way that benefits all people, including low-income families. Minter was honored at Climate Resolve’s annual Coolest in L.A. Gala, a celebration of innovation in Southern California’s Fight Against Climate Change. Active Energy Group acquires CoalSwitch site Active Energy Group announced that the acquisition of an industrial site in LumACTIVE ENERGY GROUP berton, North Carolina, has been satisfied. The site will become the new base for all AEG's CoalSwitch operations in the U.S., and house the first permanent production facility for CoalSwitch. The site is strategically located close to AEG’s joint-venture partner, Georgia Renewable Power LLC, and is also in a prime lumber district in the U.S. It includes up to 415,000 square feet of covered factory space, and 151 acres of surrounding land. It was purchased for a total consideration of $3.3 million. General session participants meet outside the Savannah Conference Center. Patrick Serfass, executive director, American Biogas Council; Carrie Annand, executive director, Biomass Power Association; Seth Ginther, executive director, U.S. Industrial Wood Pellet Association; Tim Portz, executive director, Pellet Fuels Institute; and Dan Wilson, board of directors chairman, Biomass Thermal Energy Council. Not pictured: Johannes Escuardo, executive director, Coalition for Renewable Natural Gas. city rich with history and unmatched hospitality, Savannah, Georgia, welcomed the largest biomass gathering in the world in mid-March. At the International Biomass Conference & Expo, technology developers, academia, investors, service and equipment providers, plant personnel and a range of other stakeholders met to gather information, network and collaborate. Following a day-long preconference workshop focused on biomass feedstock logistics, the event kicked off with a keynote address delivered by Georgia Public Service Commissioner Tim Echols. Annual award recipients were named by Biomass Magazine, with Gordon Murray, executive director of the Wood Pellet Association of Canada, receiving the Excellence in Bioenergy Award, and Goddard College the Groundbreaker of the Year Award. Next, trade organization executives participated in an industry roundtable to discuss policy, challenges, priorities, and the content and significance of the messages the industry conveys to policymakers and the public. Panelists included Patrick Serfass, American Biogas Council; Tim Portz, Pellet Fuels Institute; Carrie Annand, Biomass Power Association; Seth Ginther, U.S. Industrial Pellet Association; Johannes Escudero, Coalition for Renewable Natural Gas; and Dan Wilson, Biomass Thermal Energy Council. Roughly 80 speakers presented in breakout sessions focused on biomass heat and power, pellets and densified biomass, biogas and waste-to-energy, and advanced biofuels, with the closing event bringing attendees to the East Coast Terminal to observe how the state-of-the-facility reviews, stores and loads wood pellets onto waiting ships. The 2020 International Biomass Conference & Expo will be held in Nashville, Tennessee, Feb. 3-5. Anna Simet, editor of Biomass Magazine, left, interviews association leaders during the International Biomass Conference & Expo general session industry roundtable. Participating in the discussion were Serfass, Annand, Portz, Ginther, Escudero and Wilson. Tim Echols, Commissioner of Georgia Public Service Commission, welcomes attendees with a discussion on forestry and biomass energy in the state. Serfass and Annand discuss the impact implementation of e-RINs under the Renewable Fuel Standard would have on the biomass and biogas power sectors. Escudero, center, highlights the role that specific public policy and related advocacy continues to play in protecting and expanding existing markets, as well as creating new ones. Above: Kevin Desjardins, Keith Manufacturing Co., and Tim Portz, Pellet Fuels Institute, perform the trade show and welcome reception ribbon-cutting. Left: Gordon Murray, Wood Pellet Association of Canada, was named recipient of the Excellence in Bioenergy Award, presented by Simet. Katrina Bagwell and Tommy Sweat, Environmental Planning Specialists, with Bernard Scheff, American Biogas Council, and Lynn Beane, Montrose Environmental Group. Matt Valentine, Mark Jones Jr. and Johnny Sanders, Lubrication Engineers. Alyssa Siemonsma and Tiffany Trottman, Nelson Engineering. Greg Manley, Cooper Rainey and Bill Conroy, Rossee Oil Co.
Todd Taylor, CEO, Avisen Legal, moderates a biogas and waste-to-energy panel including participants Michael Corbett, director of applied Science, Divert; Justin Price, principal, Evergreen Engineering Inc.; and Roger Ford, CEO, Eureka Energy Corp.
Brad Bleima, senior engineer, EcoEngineers; Serfass and Bob Cleaves, president, Biomass Power Association, present in detail on the history of the Renewable Fuels Standard and implementation of e-RINs. Brian Edwards, director of engineering, Conversion Technology Inc., discusses combustible dust hazard analyses during a dust control and fire risk mitigation panel, which included speakers Jeff Nichols, managing partner, Industrial Fire Protection LLC; Vahid Ebadat, CEO, Stonehouse Process Safety; and Derek Stuart, global product manager of power, AMETEK Land. Fifty-plus attendees toured Peeples Industries' East Coast Terminal Savannah Pellet Facility, where two storage domes give the facility 50,000 tons of dry, covered storage on-site, and the rail infrastructure can accommodate 80-car unit trains. This facility connects Georgia’s largest wood pellet manufacturers with the rail unloading and ship loading infrastructure required to get finished product to overseas power facilities. Growing toward a greener, cleaner future. We’re not done yet, but I can see the finish line.” Twenty-five months after Davis’ first day, the Franklin and Madison projects are 98 percent complete. While the two Georgia projects began in early 2017, their origins were much earlier. Davis says in 2005 the Atlantabased Georgia Power utility company issued a request for proposal (RFP) on a renewables package that included biomass. BOOSTING YOU R B USINESS FROM FIE LD TO F U E L H OW CAN WE H E LP FU E L YO U R B U S I N ES S? Biomass, this meant building the world’s largest biomass plant, backed up by a new ANDRITZ dedicated service center in their own backyard. Find out how our world-class processing solutions and services can fuel your business at andritz.com/ft. Enviva broke ground on the Hamlet pellet plant in November 2017, and is beginning the final stages of the commissioning process. It is expected to produce 600,000 metric tons of pellets per year, beginning in the second quarter this year. The pellets will be shipped by rail to the company’s marine terminal at the Port of Wilmington, North Carolina. When it comes to new additions or expansions, Mrose says Enviva prefers to stick with what’s been successfully proven to work. ¦CONSTRUCTION we're doing that showcases some of our innovation and leadership on the topic,” Keppler adds. stoker-fired grate systems, which are the easiest to convert to cofiring. This is especially true when cofiring wood with coal at small percentages or with similar particle sizes; for example, wood chips and pea coal. Some of this resource is being used as a feedstock for a pellet mill in North Pole, Alaska, which is approximately 10 miles from downtown Fairbanks. The Aurora Power Plant, located in downtown Fairbanks, Alaska, was the site of the cofiring test burns. This facility has a 32MW nameplate capacity, sells up to 25 MW to a local utility, and burns about 210,000 tons of coal per year. Net electrical generation is close to 180,000 megawatt-hours per year. In addition to electricity, the plant provides steam and hot water for a district heating system serving downtown Fairbanks. This network includes approximately 15 miles of buried pipeline and reaches approximately 50 buildings. combustion air and dispose of ashes. Grate systems, either stationary or traveling, are most common for small-scale energy production facilities (i.e., less than about 50 MW) that combust solid fuels. In grate systems, larger fuel particles of both coal and biomass can rest on the grate, while any fine particles that are included in the fuel mix will burn in suspension above the grate. Research discussed in this article was completed at a combustion unit utilizing a conical fuel delivery system, which is a cone-shaped chamber located adjacent to the combustion chamber. The conical receives fuel until a certain predetermined level is reached, and then dumps fuel by gravity into the combustion chamber. An advantage of gravity-fed conicals is their reduced likelihood of jamming, a problem sometimes encountered with other types of fuel distribution systems. However, a disadvantage of conicals is that the gravity feed can sometimes distribute different-sized particles unevenly in the combustion chamber. CONTRIBUTION: The claims and statements made in this article belong exclusively to the author(s) and do not necessarily reflect the views of Biomass Magazine or its advertisers. All questions pertaining to this article should be directed to the author(s). be a consideration for other cofiring facilities (for example, municipal power plants) located centrally in or near a downtown area. If Aurora were to cofire on a regular basis, or at higher percentages of biomass, additional storage and handling equipment would be needed. For small-scale grate systems, the easiest way to get a uniform fuel mixture is ususally to combine biomass and coal as it is transported inside the facility, often by conveyor. Despite the potential challenges of mixing wood and coal particles in real time during conveyance, our procedures resulted in very uniform fuel blends—credit to the power plant personnel in charge of fuel handling. It should be noted that although the procedure for introducing the biomass to the coal stream was simple for short tests, its manual nature makes it unsuitable for continuous cofiring, which would require a retrofit to the feed and mixing systems. Goals of the study included: to test the proof of concept of cofiring quaking aspen wood chips and coal, under two different cofiring percentages; to measure the combustion gases in stack emissions during cofiring; and to identify any operational problems or challenges at the power plant associated with cofiring. Many fuel-related variables can influence the effectiveness of cofiring operations, such as moisture content, the percentage of biomass included in the fuel stream, relative energy content, fuel particle size distributions and quality (including the presence of bark, needles and dirt). Fuel characteristics can also influence other operational aspects of cofiring, including fuel storage and conveying, mixing, distribution on the combustion grate, composition of combustion gasses and ash generation. In this study, the wood and fuel particles were approximately the same size, facilitating mixing and conveying. The bulk density and particle geometry of the wood and coal can influence the mixing properties of the blend. In the combustion chamber, wood fuel can potentially burn more rapidly than the coal. Thus, mill residues from an ongoing wood products facility are a preferred source for reliability and consistency, especially if available at low cost. Alaska is perhaps unique in that the local subbituminous coal has about the same Btu content as dried wood fuel (both are close to 8,000 Btu per lb.). Therefore, mixing these fuels should require little adjustment to feed rates to achieve the same energy output. This is not the case in the contiguous U.S., particularly where eastern coals are used, which may have as much as twice the energy content of biomass. ¦CONTRIBUTION air (percentage). The TESTO unit was used to measure NO and NO2 (ppm) along with the same parameters as the Bacharach analyzer. Opacity was measured by Aurora Power Plant’s in-house monitoring equipment. Data was collected either once every two minutes (Bacharach) or once every 30 seconds (TESTO). Low-level cofiring tests: Average flue gas concentrations for CO increased markedly (by 82.4 percent) versus coal-only combustion. This was in contrast to CO2 concentrations, which decreased by 7.5 percent for lowlevel cofiring. Also for low-level cofiring, NO decreased by 20.32 ppm or 17.7 percent, and NO2 increased by 2.27ppm or 13.3 percent (all versus coal-only combustion). Other cofiring research (Tillman, et al. 2001) has indicated a greater than 1 percent reduction in NOx compounds for each 1 percent level of cofiring. Finally, opacity increased slightly due to low-level cofiring, from an average of 5.7 to 5.9 percent (cofiring versus baseline). Thus, higher CO levels and particulate carryover can occur when cofiring wood and coal (versus burning coal only). BIOMASS to ENERGY ProcessBarron is there every step of the way. future consideration because of air quality concerns in Fairbanks (particularly during winter months). Thus, any cofiring strategies aimed to reduce opacity could become beneficial. Totential logistic and operational challenges when cofiring were also observed. Our work in Alaska confirmed what numerous studies have observed—that cofiring biomass at low levels in grate combustion systems can be performed with relative ease, having only minor impacts on plant operations, including fuel storage, handling and performance. For low-level cofiring, the mixed fuel burned well with no issues or adjustments to combustion conditions. However, high-level cofiring was slightly more challenging, requiring careful control of feed rates to maintain uniform combustion across the grate. The wood’s high moisture content, estimated to be close to 40 percent green basis, was likely a factor influencing combustion during the high cofire tests. In addition to generating greater incomplete combustion products such as CO, high moisture conditions also require more turbulent mixing in the flame zone for complete combustion to occur. CONTRIBUTION¦ Since the wood fuel was well-screened, individual particles were uniformly sized, and were only slightly larger than most coal particles. This could explain the relative ease of fuel mixing, and the uniform conditions occurring throughout conveying and combustion. The gravity-fed conical did a good job of distributing fuel uniformly across the grate, which was also likely related to the uniform chip size and moisture content. The following specific comments were offered by the plant operator who monitored cofiring testing: • Cofiring rates: In general, aspen chips cofired at the low rate introduced no problems or challenges. For the high cofiring rate, there was some minor segregation of aspen chips from coal. Combustion was also somewhat more difficult due to greater level of moisture in the combustion chamber. • Moisture content: lf chips had been at a lower moisture content, rather than fresh green, they might have burned more uniformly with more consistent steam load, even at the higher cofire rate. • Spatial distribution of wood and coal: In general, the spatial distribution of wood and coal in the combustion chamber was quite uniform, and no problems were noted. • Particle size range: If wood chips were oversized or too stringy, they could get caught in the under bunker part of the fuel conveying system, causing problems. Chips or hog fuel up to a 2-inch size maximum dimension range could work well for the plant’s current fuel handling capability. Sawdust size should work well as long as it can be conveyed satisfactorily. • Contaminants: Dirt, small rocks and other contaminants could be a problem, but not a cofiring showstopper. Any rocks in bottom ash would need to be run through a crusher, creating an additional processing step. In this era of digital marketing, creating an integrated marketing approach is more important than ever. We have now added webinars to our media mix and advertising opportunities you can incorporate into your marketing efforts that make it easy to maximize your advertising impact, at the same time gain access to hundreds of contacts focused on a niche market. The 13th annual International Biomass Conference & Expo will take place February 3-5, 2020, at the Gaylord Opry Resort & Convention Center, Nashville, Tennessee. This dynamic event unites industry professionals from all sectors of the world’s interconnected biomass utilization industries—biobased power, thermal energy, fuels and chemicals. Your company can become a weekly Top News video sponsor. SPONSOR THE VIDEO Your company can become a Top News video sponsor. Multiple packages are available, including a sponsor call out from the program host with your information displayed to having your own 10 to 15 second commercial run at the beginning of the broadcast. - Top News video is accessed by 24,000 subscribers on our weekly e-Newsletter - Top News video is accessed by 44,000+ visitors per month. - Sponsor detail can be a logo or can include imagery. - Name of sponsors will be included under the video link on the website. - Sponsor name will be included on archived video listings. The Project Development, Plant Construction, and On-Site Energy issue.